a person you have been living with in a genuine and subsisting relationship, like marriage or civil partnership, for at least 2 years before the day you apply. I (UK HOST/FAMILY) is writing this letter to serve as an official invitation for my (STATE RELATIONSHIP), (NAME OF APPLICANT) to come and spend (STATE DURATION OF INTENDED STAY) holiday with me/my family in the UK/US/Canada/Ireland. He/She will be accommodated and adequately taken care of by me/my family in my/our (DESCRIBE ACCOMMODATION) home, (ADDRESS). (STATE WHY YOU WANT THE FAMILY TO VISIT). If you may require further clarification or confirmation, kindly call me on (PHONE NUMBERS - PRIMARY AND SECONDARY NUMBERS). Documents showing evidence of employment and finance. No your UK host cannot apply on your behalf, you are to apply for your visa in your country of residence. The sample above suffice, just change the details (STATE WHY YOU INVITE HIM - for your birthday celebration). How can one stay on a visit, and also I have a very close friend wanting me to come start a life with her a citizen of the u.k what visa is best to apply for thank you. hello my uncle wants to invite me to the uk for a ten day visit but he is only responsible for my accommodation in his house, i would fend for the rest of my bills. Please what is the format of the invitation letter and how big does his apartment have to be. he lives alone in a one bedroom. His accommodation is acceptable if he live alone in the one bedroom apartment. Anything above 2 adult (you and him) is overcrowding. And for invitation letter format, The sample above suffice. Good day sir pls I what to apply for Slovenia Visa my girl friend invite me to come over and we what to marry ourself what do I do pls help me? 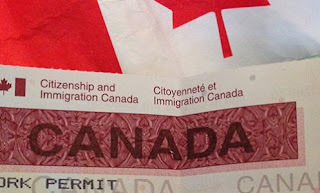 I don't know weather its true or not I heard that getting family visa is easier in Canada than other countries. Although I have not meet any Immigration Consultant but trying to get some information from Internet.